Please pat yourself on the back! As we squeezed into the "Static" last time, your mission radio station has picked up its second "Radio Station of the Year" Gabriel Award in a row! KNOM�s owner, Fairbanks bishop Michael J. Kaniecki, SJ, will attend the award ceremony (there�s a national bishops� meeting nearby the following day), and so will KNOM manager Tom Busch, at the end of a trip recruiting potential volunteers. Washington, DC attorneys Lee Knauer and Christine Simpson, and consulting engineer Jack Mullaney, all of whom contribute their services to KNOM at no charge, plan to attend, and we�re hoping to see several benefactors and friends. The awards ceremony banquet begins 6:30 PM November 8th at the Arlington, VA Hilton. We�d be delighted if you could share the evening with us. The Gabriel organizers have asked us to be a clearing house for any KNOM-related attendees. We�ll all sit together. If you plan to attend, please send a $55 check for each attendee, made out to "Unda-USA," to Tom Busch at KNOM. The deadline is October 24th. WE�LL BE SAYING GOODBYE to KNOM news director Tom Bunger and longtime volunteer Linda Raab, here sharing a laugh in the KNOM front office. We hope it won�t be a genuine farewell for either of these wonderful staff. 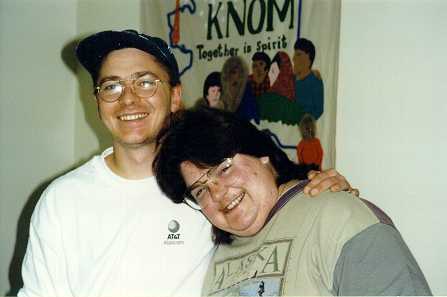 Tom joined KNOM as a volunteer in 1993. He�s accepted a job with Nome�s Internet service and will continue to do "fun stuff" at KNOM in spare time. 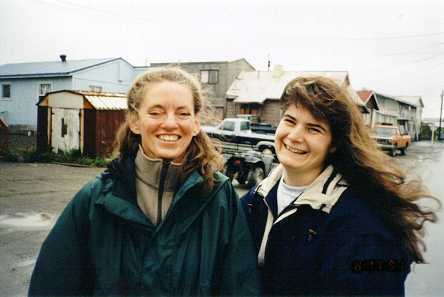 Linda, a 1985-86 volunteer, has flown to Nome 11 times to help out. She�s returning to Portland to assist her mother, who is being forced to relocate. Linda will return, at least briefly, in the spring. May God smile on both Tom and Linda! Top of page AND COMINGS: September 30th we greet incoming volunteer Anthony Galluzzo from New York City after a long, long day in airplanes. Welcome, Anthony! Our sincere thanks for your prayers and for your ongoing financial support, both of which make our broadcasting possible throughout this vast region. May God bless you for your kindness. 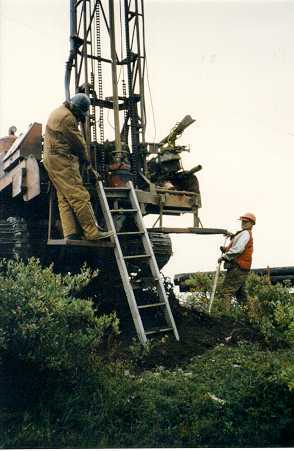 top of page PILING IT ON (left): Thirty feet from the new transmitter building, a crew drilled four pilings into the frozen permafrost, a foundation for our emergency generator building. The Northern Lights 66 kilowatt diesel generator arrived in Nome on September 18th, and is being stored in town until the 12-foot by 12-foot building is constructed. It replaces a smaller Bedford diesel, installed back in 1972. Contractor Randy Pomeranz intends to complete the small building by early October. In KNOM�s first year, 1971-72, the station went off the air 69 times because of power failures, one of them two days long! Things have greatly improved in the past few years, it�s still common for power to drop several times in a winter, ordinarily during blizzards, when the wind at our remote site can routinely exceed 100 MPH. Oh, Lord, in my present need, help me believe that You are aware of my anxiety and will do what is best for me. Give me the strength to trust You and to put the present and future in Your merciful hands. Grant this through Jesus Christ, our Lord. Amen. Top of page WELCOME to Paula (Mrs. Les) Brown (at left), who has been helping out unofficially from time to time, and to Connie Fessel, who arrived from Milwaukee at the end of August. Within a week, Connie was already hard at work deejaying the KNOM morning show and taking charge of our educational spots. Welcome! Top of page TANKS! 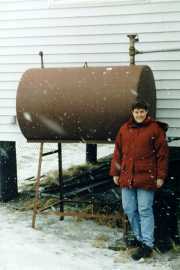 Last May, volunteer Mary Davenport posed by KNOM�s 300-gallon heating fuel tank. Because the studio building is so well insulated, even in Nome�s brutal winter weather, the station consumes less than a tankful of fuel every year! We ran so many construction photos in the newsletter this past summer that Mary�s picture wasn�t published until now, after Mary had already moved to Chicago to return to school after two wonderful, hardworking volunteer years. As with Tom Bunger and Linda Raab, we offer Mary our thanks and our prayerful wishes for a happy and successful future. Thank you, Mary! THE GREAT DEBATE in Alaska these days centers around subsistence, the process of living off the land. It�s a complicated series of issues. Should the right to live a subsistence lifestyle be dictated by cultural history? Solely by need? By where you live? Even traditional Eskimo and Indian groups cannot fully agree on how Alaska�s precious fish and wildlife should be managed. In the past several weeks, KNOM has brought our listeners live two-day coverage of a native subsistence "summit" meeting in Anchorage, a half-day of federal testimony live from the town of Bethel, and two special call-in programs, inviting remote villagers to participate in the debate. Top of Page WILL-FULLY: We�ve been mentioning wills a lot, and you�ve probably noticed that many other missions and charities have, too. That�s for a couple of reasons. First of all, the surprising fact is that 73% of Americans do not have wills. A will, of course, allows you to carry out your wishes. Without one, the state decides on the disposition of an estate. If you don�t have a will, most family attorneys can help you produce one. Most wills cost a few hundred dollars. Second, a will can ordinarily allow a person to make immense positive impacts on their favorite charities, far beyond what they can afford to contribute while they are alive, allowing the valuable work which they support to continue successfully far into the future. 25,000 WATT UPDATE: Since mid-August, we have been transmitting with our new transmitter, with the power reduced to 10,000 Watts. 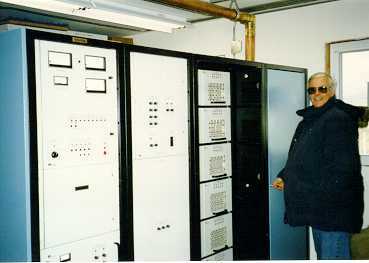 Here, general manager Tom Busch gives the transmitter its daily checkup. Our kingdom for a fence! Before applying for final 25,000 Watt authority, we must prove to the FCC that the tower is properly fenced, out to where the radiation is low enough that people won�t be harmed. On September 11th, consulting engineer Mel Sather flew to Nome and performed the appropriate measurements. For 25,000 Watts, our fence needs to be extended 4-1/2 feet on one side, 2-1/2 feet on the other. The problem: getting our hands on a post hole digger so we can build the new fence! They�re all being used on other projects in town. If the situation extends another week, Les Brown and Tom Busch will roll up their sleeves and dig the holes the old fashioned way. Stay tuned! INSPIRATIONAL SPOT: Jesus was born in a borrowed manger. He preached from a borrowed boat, entered Jerusalem on a borrowed donkey, ate the Last Supper in a borrowed room, and finally, was buried in a borrowed tomb. Does that tell us something about our tendency to own so many things and make them so important in our lives? October should bring the mission completion of our emergency generator building, as well as an enlarged tower fence. Of course, in addition to all of the work involved, the primary work of our mission continues, beaming inspiration, education, information, news and positive entertainment into dozens of incredibly remote Eskimo and Athabascan Indian villages. We thank you for your prayers and for your incredibly generous financial support. Without either, our mission would not survive. Thank you so much. Until next time, may God richly bless you for your kindness.